Need to replace your umbrella? Welcome to The London Umbrella Seller! We've been researching, designing and testing umbrella for many years and understand what makes a great umbrella. This website is our portal to pass this expertise onto you so you can choose the perfect umbrella for you. 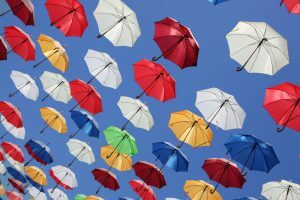 In this article we've collated five of our all time favourite umbrellas to make your decision so much easier. We've researched hundreds of models so you don't have to! What is an umbrella made of? How to pick up an umbrella? How to use an umbrella? How to fix umbrella tips? How to repair an automatic umbrella? A relative newcomer in the umbrella world, inverted umbrellas are as practical as they are quirky. The sturdy construction of this one makes it stand out from other inverted umbrellas on the market. It comes in many colors and patterns which is a positive, too. The inverted umbrella style has many practical applications. Rather than getting soaked from a wet traditional umbrella, the reverse mechanism puts the dry side on the outside. 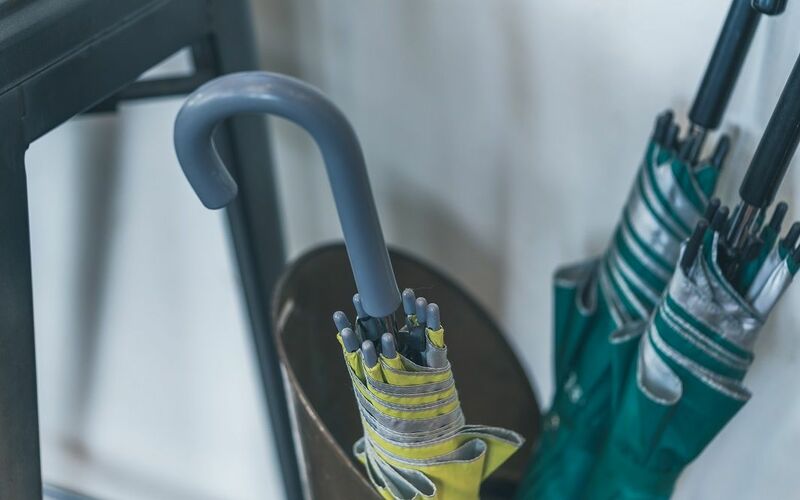 This inverted umbrella has a stainless steel frame to withstand strong winds. The carbon fiber handle also helps it maintain its durability and strength in harsh conditions. Additionally, the unique C-shaped handle allows for hands-free activities when folded. So, you can easily hang it from your wrist or hook it onto a bag. The shape isn’t the only thing that’s great about the handle. It’s also non-slip and anti-sweat to reduce accidental drenching. Lastly, the canopy is a double layer 210T fabric that is high density, light, and waterproof, not just water repellant. This helps keep you drier than many other umbrellas on the market. The inverted design is a unique way to stay dry without making a mess when going in and out of shelter. A C-shaped handle gives users great carrying options, too. Also noteworthy is the roomy canopy with waterproof fabric that keeps users very dry. Furthermore, numerous vibrant color patterns make this Owen Kyne umbrella more appealing than its competitors. This inverted umbrella seems to have some quality control issues. Sometimes an umbrella won’t stay open, or the handle will come off. Fortunately, customer service is very helpful about sending replacements if needed. Finding a true windproof umbrella may be hard to find. Many umbrellas claim that they are windproof but you never know if that’s really true until you put it to the test. The Repel umbrella may be the best umbrella in this aspect because it can really withstand gusty winds. This umbrella may be tiny, but it has a lot of weather stopping power. At only 15 ounces, and 11.5 inches in length, it is small enough to stick in a backpack or purse. Rather than the standard 6 to 8 aluminum ribs of most other umbrellas on the market, this one has 9 fiberglass ones that are resin-reinforced. This allows the umbrella to flex a little instead of turning inside out. Additionally, using Teflon technology, this umbrella is waterproof and dries instantly. It’s also automatic so you can open and close it with one hand. Lastly, this umbrella comes with a lifetime replacement guarantee which may give buyers confidence in trying out a new umbrella for the rainy season. This umbrella holds up relatively well in most weather conditions. Will it withstand a tornado? Probably not, but unless you are in severe weather this umbrella may hold up better than others. And if something goes wrong, customer service is very prompt and accommodating. The open/close mechanism is very strong and forceful. So you may have to be very careful when opening the umbrella, and closing it may be an issue as well. Some users have to fight with their umbrella to get it closed again. 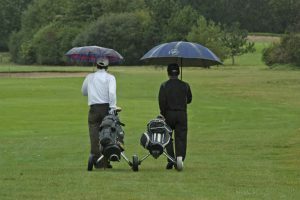 Is the rain ruining your golf game? You may need a golf umbrella. 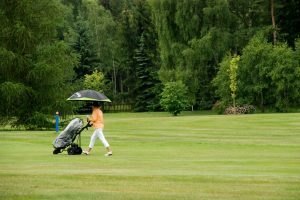 The Rainlax golf umbrella works in all weather, including sunny UV saturated situations. Not just for golfers, this umbrella is also good for other uses including the beach. It has a large 62-inch water-repellent canopy that can provide shelter for 2 to 3 people at a time. The canopy also has a layer of silver coating that provides protection from UV rays. In addition, this umbrella has 8 fiberglass ribs that ensures the chances of it flipping inside out is minimal. This combined with a steel frame gives it added strong wind protection. 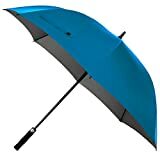 Lastly, this umbrella features a comfort stick-style handle with an automatic open button. It’s comfortable to hold, and easy to open despite its size. The Rainlax golf umbrella is very sturdy. When it works, it keeps you dry and comfortable in most weather conditions. The weatherproof canopy also keeps everyone reasonably dry and protected with minimal fuss. 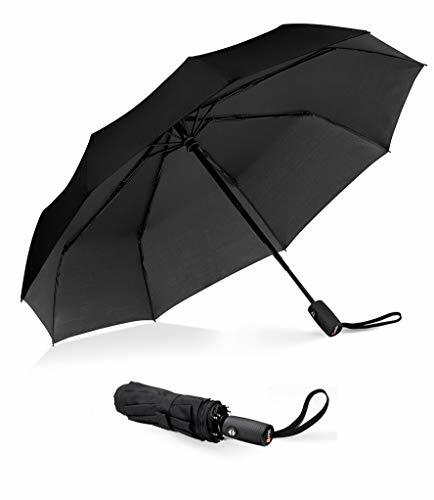 Unfortunately, there is no such thing as the perfect umbrella, and this one suffers a couple of flaws; one of the most notable is the fragile plastic parts that connect various parts of the umbrella. While the construction is sturdy, the plastic pieces are not very durable and are prone to breaking. Luckily, there is a guarantee for this umbrella just in case you do need to replace parts or the whole umbrella. If you need another option that stands up to wind, the EEZ-Y umbrella may be the one for you. 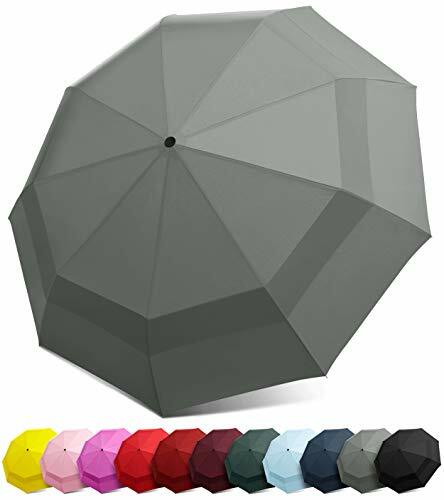 This compact umbrella features a vented canopy that allows wind to pass through the fabric instead of fighting against it. 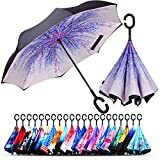 Need an umbrella that fits in your purse? This one may be the one for you. Like many umbrellas in this class, it is only 11-inches long when folded, making it easy to slip into a bag before you leave the house. The canopy, while relatively small, features a unique double construction. The main part allows wind to pass through a series of vents, while the other canopy is a 210T water repellent fabric that protects you from water. Furthermore, this umbrella has a fiberglass frame, including 9 ribs. 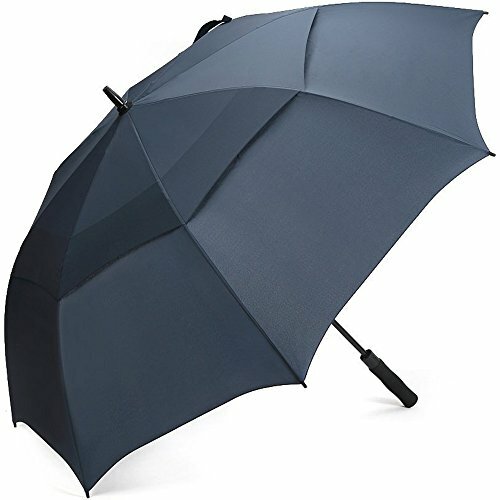 This gives the umbrella extra sturdiness without adding additional overall weight. EEZ-Y delivers a solid compact automatic umbrella option for most situations. While this may flip inside out from time to time, its sturdy construction may minimize the chance of that happening. While it does a great job of withstanding most windy conditions, depending on your canopy position you may still experience some flipping. Also, the canopy may be too small for large-sized adults. Unfortunately, this is a common problem for many compact umbrellas though. If you like the idea of a double canopy but need the large size of a golf umbrella, G4Free may be the right one for you. This all-weather umbrella also comes with a lifetime guarantee so you can buy it virtually risk free. Whether you need protection from the sun or rain, this large double canopy can protect you. It’s vented to allow wind to pass through, minimizing the chance of your umbrella turning inside out. This umbrella also protects you from 99.5% UV rays with SPF 50+ protection on the canopy. The handle is a comfortable ergonomic design. Made from EVA, this comfortable grip allows you to hold the umbrella easily while minimizing hand fatigue. 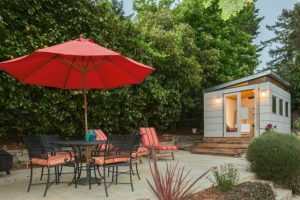 A fiberglass frame also eliminates some of the potential weight, while also lending to its overall strength and durability. The large canopy protects 2-3 people in various weather conditions. It’s relatively windproof with minimal flipping, too. This umbrella really shines, though, with its manufacturer’s helpful customer service support. Poor quality control keeps this umbrella from being the absolute best umbrella on the market. Some units break after a couple of uses, while others last much longer. Luckily, it comes with a lifetime guarantee so getting a replacement is relatively simple. There’s no “right” umbrella for every person. 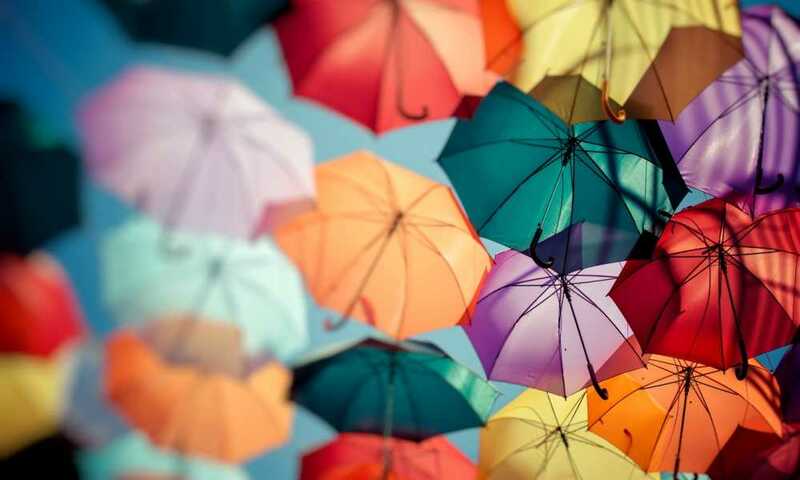 Umbrella preferences vary from person to person. So, if none of our suggested ones were the right ones for you, here are some things to look for when searching for the perfect umbrella. Think an umbrella is just an umbrella and that they’re all the same? Unfortunately, it’s not that simple. There are different types of umbrellas, and some are better in certain situations than others. Take a look at some popular styles below. This style is what most people think of when imagining an umbrella. This modern folded umbrella has a shaft that may be made from different materials, like polyester, metal, or wood. In addition, the canopy is typically a microfiber material. The automatic is a compact umbrella that fits into your purse, backpack, or briefcase. Designed so that you can open and close it with one hand, this umbrella style is one of the most common. The pocket umbrella is smaller than an automatic one. These umbrellas are small enough to fit in most pockets. They are also commonly used in emergency situations when you find yourself caught in a sudden downpour. Because they are so small and lightweight, you can carry one all the time without it becoming obtrusive. Unfortunately, these types are known to be poorly constructed and not very durable. 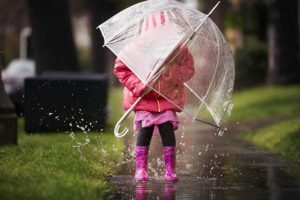 Consequently, you are bound to get wet if you are in the rain too long or are in windy conditions. You may remember these types of umbrellas from your childhood. The bubble umbrella has a distinctive tall spherical shape, and usually have some type of transparent material for their canopy. If you live in an area that is prone to stormy or high wind conditions, you may see people with this umbrella. Where other umbrellas may break, these are reinforced to withstand up to 55-mph winds. Golfers have a special class of umbrella designed specifically for them. The canopy diameter is much larger than a standard umbrella, sometimes reaching 70 inches. They may be easily carried in golf bags for protection from sudden rain. A relatively recent invention from the UK, the inverted umbrella allows for opening and closing in reverse. When you do this, the dry side is on the outside instead of the inside. This reverse folding mechanism helps if you are getting in and out of your car. It also helps to avoid wind damage, and may prevent water spillage when you get inside. Do you like funky colors that stand out when you pick an umbrella? Or do you go with a classic understated black? Picking out your color and design is a personal choice. You may hear talk about reflective properties of certain colors, but that mainly refers to sun umbrellas. 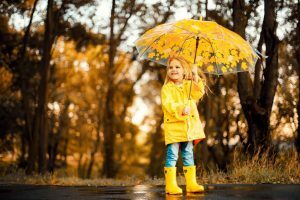 If you are carrying around an umbrella because of sudden downpours, odds are that you are not worried about sun exposure. The verdict? 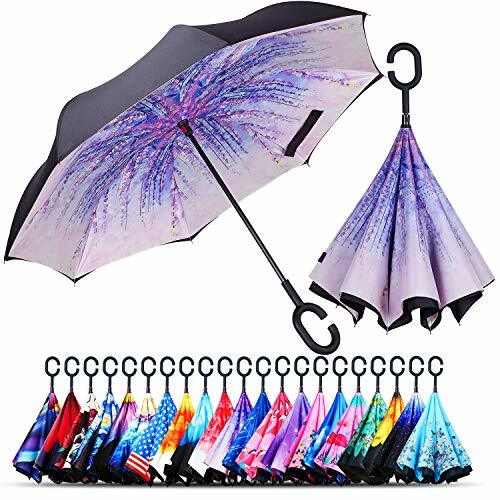 Go with the umbrella color and design that speaks to you. Umbrellas don’t vary very much when it comes to special features. For example, some umbrellas feature a double canopy that allows for wind to pass through the fabric. Ideally, this minimizes the instances of your umbrella flipping inside out. Results may vary, however, depending on the manufacturer. Fabric type may also vary between umbrellas. All are waterproof/resistant to varying degrees, but there are different fabrics to produce this effect. You may see microfiber, nylon, and plastic among the fabric choices. Additionally, some canopies are treated for sun protection, too. These types may have a separate reflective liner, or the fabric itself may be treated with an SPF agent. Lastly, the opening mechanism may vary depending on the type of umbrella you purchase. Some feature a single button for opening and closing. Others require manipulation to varying degrees. Umbrella ribs, or “spokes,” are the thin pieces of metal or fiberglass that attaches to the fabric. You can see them inside the umbrella as you open it. In umbrellas that break down, these ribs have 3 or 4 segments attached by pins to fold in upon itself. You may also be familiar with this part of the umbrella because they are typically the ones that break when your umbrella flips inside out. Frame material varies between manufacturers, but the common materials include steel, fiberglass, wood, and aluminum. Contemporary manufacturers tend to gravitate towards materials that may reduce the overall umbrella weight. So, you may see fiberglass and aluminum as popular frame materials. Some materials are more durable than others. As you may expect, using steel makes for a robust frame but it may increase the umbrella’s weight. Fiberglass, on the other hand, is lighter and more flexible than steel but isn’t as robust. There are 2 main types of umbrella handles: the hook and the straight grip. The hook is the quintessential U-shaped handle most commonly seen on straight umbrellas. They may be made from different materials such as wood or plastic. The hook handle makes it relatively easy to hold the open umbrella over your head. And it’s popular because you can hook it onto your arm when not in use. 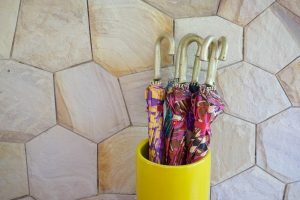 On the other hand, contemporary umbrella handles feature a straight grip. With this type, the bottom of the umbrella is reinforced with rubber, plastic, or some other type of cushion material. These are the most common in compact or automatic type umbrellas, but some straight umbrellas also use this style. Lastly, unique handles such as a C-shape are also available on certain umbrellas. Besides holding an open umbrella with an arm, these handles allow users to hook closed umbrellas around the wrist for a grip similar to a hook handle. But the C-shape is generally smaller and less obtrusive than a hook. 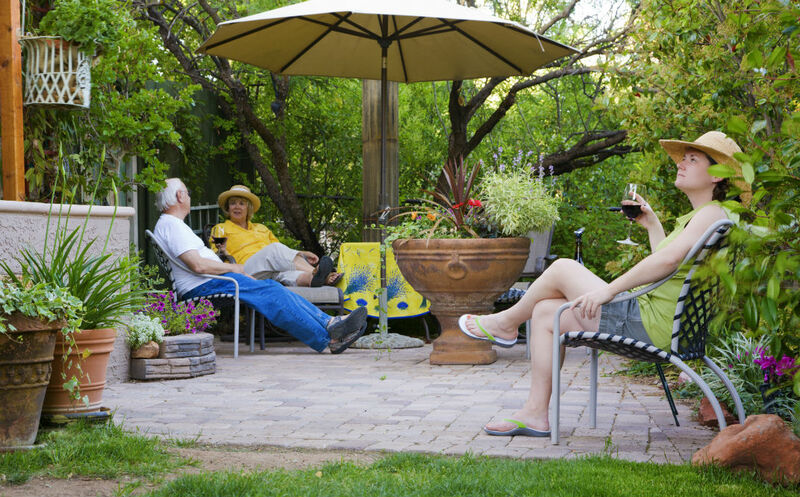 Umbrella materials are usually broken down into 3 main sections: canopy, frame, and handle. The canopy is typically made from a waterproof nylon taffeta, though other similar materials may be used. Next, the frame section in this instance includes ribs and shaft. They are generally made from the same material, though some manufacturers choose to reinforce specific parts with another material. Common materials for the frame include steel, fiberglass, aluminum, and wood. Lastly, the handle may be constructed from wood, rubber, or plastic depending on the handle type and manufacturer. Handle material is a matter of personal preference, so you may see different variations of the same handle. One of the sturdiest parts of the umbrella is the handle. So when picking up your umbrella try to grab it by its handle first. Get clear. Find a place that is outside or close to it. A doorway would work so long as no one is trying to get in at the same time. Also, make sure there aren’t people close by. You may injure them when opening an umbrella. Open the umbrella. Depending on the type of your umbrella, you may see a button on the grip or a slide on the shaft. Point the umbrella away from yourself and any potential passing people. Press the button or raise the slide until you hear it click into place. Raise your Umbrella. Finally, raise the umbrella over your head so that the canopy covers both your head and shoulders. If you are short, be careful when you do this or you may accidentally hit someone. Ideally, vertical placement should provide you with a barrier between the rain and your body. But in windy conditions you may have to adjust the angle. If your umbrella doesn’t have a free replacement program, or you simply don’t want to wait, you can fix umbrella tips yourself. Umbrella tips, or the part where the rib end attaches to the canopy, easily come apart. But there is an easy fix for that too. You just need a bottle of silicon rubber glue or something similar. Please keep in mind, though, that in this instance you should not use water-soluble glue. With your glue in hand, squeeze a little from the rib tip to the part where the canopy connects. For extra staying power, you can also squeeze a little glue in the rib hole where it used to attach. Next, press the fabric into place. You can use your fingertip or a plastic implement to do this. The idea is to create a new adhesive point to the tip. You may want to also reinforce new umbrellas by adding the glue before the threading snaps. Automatic umbrellas are difficult to repair, so if you have a replacement program for your umbrella you may want to call your manufacturer. However, if your umbrella is stuck you can try lubricating different parts of your umbrella frame. Test the shaft. Press and depress the locking mechanism for the shaft. Lubricate the top spring if it feels a little stiff. Check the Slide. Next, check the sliding mechanism. Can it slide up and down or does it get stuck? If it does, you can try cleaning the slide and applying lubricant. Check the joints. If you are having trouble closing the umbrella, the stretcher may be out of alignment. This bar folds when you close the umbrella. If it is out of alignment, it may produce a slight grinding sound or appear bent. For bent stretchers, grab a pair of pliers and straighten out the metal bar. Additionally, the rib joints are generally flimsy and if one breaks you may have problems folding your umbrella. If one is not connected, you can try threading a small piece of wire to reconnect the rib joints. We feel the best umbrella on this list is the Repel Travel Umbrella. It is compact and light so you can carry it everywhere without a second thought. This great automatic umbrella features 9 fiberglass ribs for extra reinforcement in windy conditions, and the Teflon-coated canopy does a great job at keeping the rain off you. However, if you need an umbrella with a larger canopy the G4Free Golf Umbrella may be a good choice. This all-weather umbrella is rugged and sturdy. It also comes with a lifetime warranty and helpful customer service. 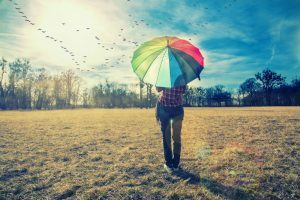 In the end, you may go through several umbrellas before finding one that’s right for you. And your experience may be different than the reviews you’ve read. So, when in doubt choose one that has a guarantee or replacement program just to be on the safe side.